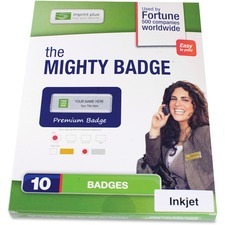 Refill kits are designed to replenish with Mighty Badge Professional Starter Kits that include the design software and badge accessories to create professional name badges. Versatile badges feature a metal plate, elegant domed lens cover and printable transparency that you can replace again and again. So you can make new badges, this refill kit contains 10 silver-colored metal 1" x 3" plates (medium plus); 10 lens covers; 2 crystal-clear inkjet insert sheets for 40 badge inserts; 2 bright white inkjet insert sheets for 40 badges; and 10 magnet fasteners. Each sheet includes 20 inserts. Refill does not include design software. 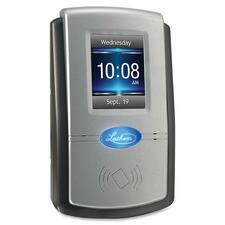 Electronic Print Time Recorder features easy one-handed, trigger-trip recording. Card or paper form activates printing mechanism. Time on face matches time stamped. Month wheel manually advances. Easy to install on a wall or table. Time recorder offers a rustproof and corrosion-resistant construction. It includes a factory-installed, blue ink ribbon. When replacing ribbon, order Acroprint 200106002. 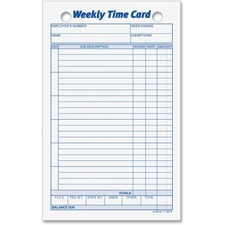 Time cards feature a weekly format and show payroll data at card bottom. Offer columns for day, job description, hours, rate amount and totals. Include space for deductions: FICA, federal and state withholding, union, other and total. Top two-hole punched cards are designed to be filled in by hand. Made of sturdy 150 lb. manila stock. Especially designed for use with Pyramid M2500 and 3700. 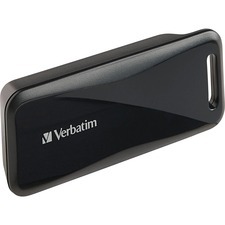 Verbatim USB-C Pocket Card Reader - microSD, microSDHC, microSDXC, SD, SDHC, SDXC, MultiMediaCard (MMC) - USB Type CExternal - 1 Pack Transfer files from your memory cards faster than ever before with the Verbatim USB-C Pocket Card Reader. This multi-functional reader supports both SD and microSD memory card formats, along with both UHS-I and UHS-II cards, with no adapter required. The USB-C Pocket Card Reader offers plug-and-play functionality with both Windows and Mac operating systems via a built-in USB-C connector, so you don't have to worry about any additional cables. This pocket card reader is small and compact, ideal for on-the-go use. Perfect for use with your USB-C laptop or computer, the USB-C Pocket Card Reader is a great choice for professionals and photography enthusiasts alike. 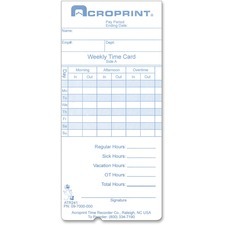 Replacement time cards are printed on both sides to accommodate two weeks on a single card. 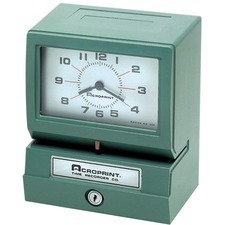 Time cards are for use with Acroprint ATR240 and ATR360 time clocks. PC600 Touch Screen Time Clock offers a simple plug-n-play Ethernet connection; full-color touch-screen interface and a proximity badge reader. Full-color screen allows tips, transfers and edits. 50-employee capacity can be expanded easily to support up to 1,000. 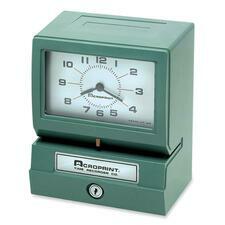 Time clock can even be accessed over the Internet. System includes 15 proximity badges (additional badges sold separately) and powerful PayClock software for editing, reporting and exporting to popular payroll applications such as QuickBooks.